They were just called "most blueswailing" by an emcee (or their manager?) introducing them before a live recording, but it wasn't part of their name, was it, Dutch? actually the band started off as the metropolis blues quartet. Top Topham was with the band only like a couple weeks or something. Then Jeff was hired when Eric left. page was the bands first choice when clapton announced he was leaving after the recording of "for your love". page however did not want to give up his lucrative session work. page recommended beck for the job. it was only after the band started having hits and when bassist paul samwell-smith left that page accepted the bands offer to join. pants with no waistband, intended to be worn below the top of the pelvic bone, thus hugging the hip. Originally, a counterculture creation when girls wore guys' jeans that had no waist and therefore slipped down around their hips. A style that evolved into fashion in the early 1970's. Often designed as unisex clothing, meaning they could be worn by men or women. becksbolero, you beat me to it. I was going to mention the Booker T & the MGs' song, too, but that album cover is great! Also, nice further detail on the Yardbirds. Thanks for the Top Topham link. I'll have to check it out later, because I've always wondered about him. His role was so minor and paved the way for such major players that I've always considered him more of whatever than Pete Best or that Stu guy. The Yardbirds weren't called the Metropolis Blues Quartet still when Eric joined, were they? Among other things, he (or Top before him) made them a quintet. Dutch, that's okay, as long as we remember that we can't believe ev'rything we read, now can we? Even on calendars (besides the dates). from my rememberance the yardbirds were the metropolis blues quartet until drummer jim mccarty joined. they then changed their name to the yardbirds. 16 year old topham was asked to leave the band due to pressure from his parents to devote all his time to his studies. 18 year old eric clapton (who was an art school friend of keith relf's) was then asked to join. top topham later played with english blues legend duster bennett. topham also played on the first solo lp by chicken shack keyboardist and future fleetwood mac member christine mcvie which was released under her maiden name christine perfect. Absolutely dig my hip hugger jeans. I said 'jeans' not the bright pink ones like in photo. I'll be wearing my hip huggers at the Beacon (forget the hot pants) ! Never got into those high waisted pants. Hig hugger bell bottoms ... Oh Yeah !!! to conform to the majority rules and mores. This is not always the right path for everyone. As with homosexuality, if a gay person tries to be straight, it can be psychologically damaging. How far to step outside of scoiety is a decision each individual must make personally. One must think about the consequences of bending the rules and consider the social ramifications of offending others. You were either straight or buzzed. When giving directions, it was "go forward"
nobody wanted to tell anyone to go "Straight"
Ayla, back in our high school, if you weren't one of the straights (there's a different way of looking at the noun, rather than being straight), you weren't necessarily buzzed, since most of us weren't stoned all the time. Also, we didn't have a term for those of us who weren't straight (or in this new sense, who wasn't a straight). There was just the straight people, and then there was us. We weren't the stoners, the burnouts, the hippies, or anything like that. Some of us were freaks, but this term still had a bit of a negative connotation, so it wasn't universally used among the non-straight. Finally, the straight/not divide transcended other high school groupings. For example, you thought of most of the jocks and most of the brains as being straight, but not all of them. Being not straight brought together people from the different groups more than being straight did. Of course, being not straight meant participating in a certain party activity, whereas there was no "unifying" activity for the straight category (just the lack of getting stoned). Back in those days (that other paragraph wasn't "finally," was it? ), there were no terms "nerd" or "geek," which are both far worse than "brain," which didn't have much of a connotation that the person was necessarily weird and out of it. There were a lot of brains who were not horribly nerdy , and there were a lot of non-brains who were. "Geeks" today are probably all brains, but back then it was just the old meaning of weirdo, maybe with an extra twist, and not necessarily smart at computers or anything. Back then, using "freak" was sorta like using "geek" today: They both have these really odd connotations (is that the third time I've used this word? ), but some people apply the terms to themselves proudly, and the terms gradually lose the worst aspects of weirdness, becoming more about being really into something. prefix meaning a great deal of, or much. It intensified the size or number of any word to which it was added. Examples: "Mondo-money, mondo-love, mondo-macho" Simillar usage as beaucoup. In 1963, MONDO CANE became a huge international sensation even garnering an Academy Award for Best Song. A collaboration between Italian directors Gualtiero Jacopetti and Franco Prosperi, it was an unprecedented collection of footage depicting taboo behavior from around the world. Shock after shock, real and staged, filled the screen appealing to voyeurs of the Now Generation. Mexican cops dressing up like hookers -- cut to backwards footage of a pig's journey in a German slaughterhouse, and so on. For years from all over the world countless freak shows followed. By the late '60s, the Mondo Movie was a firmly established, money making genre. I do remember that one. writer, scholar and counterculture personality. While attending Stanford University in 1959, he was a paid government guinea pig in early LSD experiments at the Menlo Park, California Veteran's Hospital. This would make him among the first of the psychedelic travelers, even predating Timothy Leary. Kesey was the author of "One flew over the Cuckoos Nest", 1962, "Sometimes a Great Notion" 1964 and many articles, book introductions and other sundry publications. In the mid 1960's, Kesey was arrested several times for his drug involvment and generalyy hasseled for being "diferent"
The Merry Pranksters are a group of people who originally formed around American novelist Ken Kesey and sometimes lived communally at his homes in California and Oregon. Notable members include Kesey's best friend Ken Babbs and Mountain Girl (born Carolyn Adams but best known as Mrs. Jerry Garcia), Wavy Gravy, Stewart Brand, Paul Foster and others. Their early escapades were best chronicled by Tom Wolfe in The Electric Kool-Aid Acid Test. Ken Kesey once described Wolfe's book as, "99.9% accurate" although he also complained that the celebrity status the book conveyed upon him was in some ways a burden. Ken Kesey and The Merry Pranksters are remembered chiefly for the sociological significance of a lengthy roadtrip they took in 1964, traveling across the United States in a psychedelically painted school bus enigmatically labeled "Furthur." The trip's original purpose was to celebrate the publication of Kesey's novel "Sometimes a Great Notion" and to visit the 1964 World's Fair in New York City. The Pranksters were enthusiastic users of marijuana and LSD, and in the process of their journey they are said to have "turned on" many people by introducing them to these drugs. There are no membership requirements to be a Merry Prankster. As Kesey put it when asked how you become a Merry Prankster, "I don't pick 'em, I recognize them." People who consider themselves Pranksters in spirit are said to be "on the bus" whether or not they ever actually took a bus trip with Kesey. In other words, the bus has become a metaphor for the lifestyle of anyone who is in solidarity with the psychedelic movement and who encourages others to have mind expanding experiences, with or without drugs. While everyone is invited to consider themselves a member of the Merry Pranksters, Kesey was strict about what should constitute a proper prank. He said a successful prank must not physically hurt anyone, and the person being pranked must in some way be enlightened by the experience. There's this one guitar player in the area, Jeff Kerr, who I thought was the best Allman cover player in local nightclubs back in the '70s. 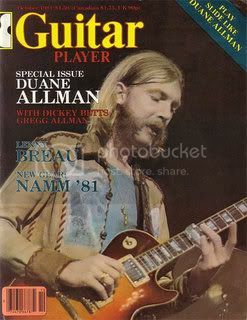 He was in a dual-guitar band, and he played the slide and other Duane parts. His latest band that I know of, from 1990-2000 (when the other guitarist moved to Chicago), was called the Mighty Pranksters. To tell the truth, I held this name against them because of its obvious link to the name Merry Pranksters and the whole acid thing that this suggests. I think it's bad enough that the Allman Brothers Band venerates shrooms. This is not just because I'm against drugs for myself or for my nieces and nephews, but because in the cases of these particular musicians (ABB and Kerr), drugs had such a negative impact, so I don't know why drugs are still being celebrated in any way. "They're BACK. Bill 'Griz' Stevens, Jeff Kerr, Brian Wilkie, Andre Mossotti, and Danny Deckard rendezvous for the first time in 2005 (yes, the reunion is now annual! ), playing their amazing mix of Grateful Dead, Allman Brothers, Little Feat, Mighty Prankster originals, and more. One of Champaign-Urbana's most beloved bands, these guys have been doing their thang long before the words 'jam band' became a popular tag and/or genre." In terms of music, as I was older in the '90s and understood music more, Kerr's guitar playing was less impressive than it had been 20 years before. The setlist, or influence list, may look good, but the Pranksters' renditions really made you wish for the originals. No doubt - these guys always make me smile! For anyone who hasn't read it, Tom Wolfe's Electric Kool-Aid Acid Test is great! keep rocking; keep doing what you are doing. Not always related to music or dancing; similar usage as keep the faith. extremely interested in something or someone. Example: "jim is heavily into Susan, who is heavily into astrology. Heavy into is the later, condensed evolution of the phrase. Heavily into was considered gramatically correct at the beginning of the 1960's, yet heavy into became correct along the way. Of course I knew enough people that were heavily into some not so nice drugs back then, ugly scene. Dr. Emmett Brown: There's that word again; " heavy". Why are things so heavy in the future? Is there a problem with the earth's gravitational pull?